No one can deny the unparalleled beauty of Komodo National Park, Flores. Dangling in the tip of Lesser Sunda Islands archipelago, Komodo is flowing with rolling hills, jagged islands, and wrapped by crazily azure ocean. Between all of these are the rare and notorious Komodo Dragons, blushing pink beaches, and dozens of empty island to explore. And sometimes, it’s totally okay to be a little bit self-centered and enjoy it all for yourself. At time like this. it’s best to take a Komodo boat charter to enjoy the amazing Komodo without disturbance. Not everyone is born with easy going and bubbly personality. Yet, open trip dominates the boat trip market in Labuan bag and it can be quite a problems or those who naturally feel vulnerable in a group of strangers. There are people who are acutely awkward, a big introvert, to those who are having a serious problem like panic attack when they are openly exposed to a bunch of people they just met. 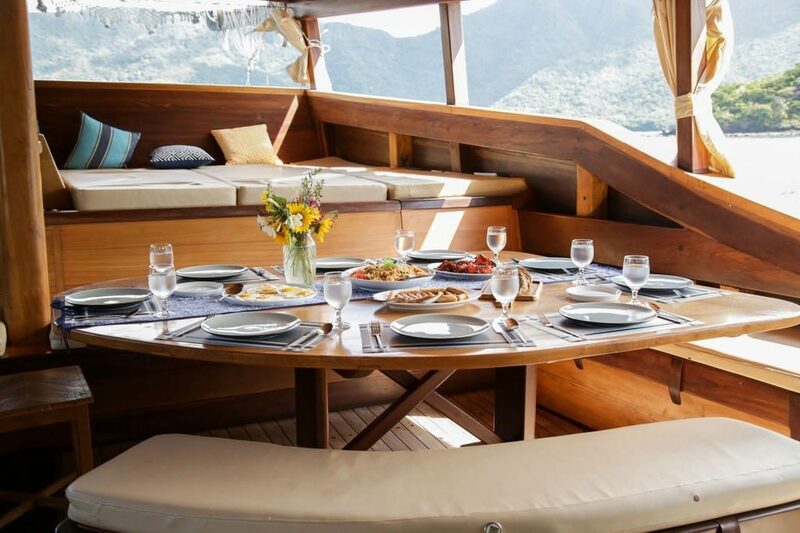 Komodo boat charter provides a safe haven for people with such condition; the right vessel that won’t trigger anxiety or insecurity and let them enjoy the beauty of Komodo in totally peaceful setting. All of us need a special privacy when it comes to honeymoon. It’s time to relax after the stressful wedding, celebrate the new life, and of course, to be drowned in love! In times like this, all you want is to be in each other’s arms and feel the world as yours. Now, there’s nothing as perfect as the exotic Komodo for momentarily escape from reality and do romantic thing together, even so with the remoteness of the area. Chartering your own Komodo boat is the best way to have a completely undisturbed honeymoon vacation. Some people want to enjoy the Jurassic-esque Komodo to launch a unique private party that no guests can ever forget. There are many reasons to launch a party on boat; a small wedding party, halloween themed party, bachelor party, or as simple as summer party to enjoy a close friendship. Don’t let your party disturb the other. Take one chartered Komodo boat and decorate it as you wish. Just remember to not get excited and light fireworks—the sparks can ignite serious fire in the dehydrated savannah and burn the whole island. It has happened twice in the National Park before. Komodo boat wedding are amongst the most memorable, especially with crystal blue waters dropping as wonderful background as you say the vow. Of course, you will need a Komodo boat charter for such sacred ceremony—there’s no way you can have a wedding in a regular open trip boats. Enjoy the romantic evening as Komodo’s sky display gorgeous pinkish hue with a glass of sparkling wine and your better half on your side.